Arby's has been slinging gyros since 2014 when it became the largest chain to offer the traditional Greek sandwich. Only, Arby's wasn't really doing them all that traditionally. It was a "gyro." The menu items were basically deli sandwiches singing the chorus to a David Bowie classic, "We could be gyros." But no longer are gyros (yeer-o, not ji-ro or guy-ro) getting short shrift at Arby's. For a limited time, the fast-food chain best known for its roast beef will offer a more traditional gyro. 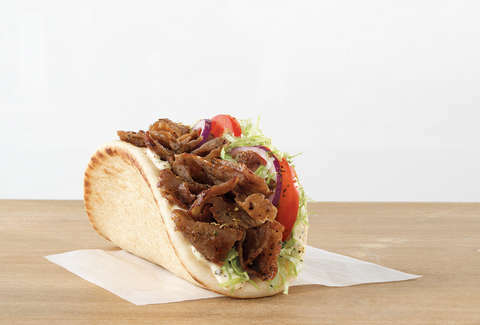 The new product features a blend of lamb and beef with Mediterranean spices as well as lettuce, tomatoes, red onions, tzatziki sauce, and Greek seasoning. "We’ve been selling amazing gyros for two years, but it turns out gyros started in Greece, not Arby's," said pithy chief marketing officer and brand president Rob Lynch. "To to deliver an authentic Greek gyro experience, we sourced gyro meat sliced from spit rotisseries like the ones found in traditional Greek restaurants." That does not, however, mean that franchises have rotisseries inside the restaurant. Prior to the release of this new style of gyro, the chain was selling 27 million gyros a year, more than any other restaurant in America. Arby's will likely hold down that title for a while as the only restaurant offering gyros in many markets. However, their 710-calorie version probably won't top grabbing one from a street vendor cutting meat fresh off a sweating rotisserie. Dustin Nelson is a Senior Writer on the news team at Thrillist. He could really go for some Mamoun's right now. Follow him @dlukenelson.